PHOTO CAPTION: A kayaker launches an expedition from scenic Bender Landing on the Siuslaw River's north fork. With well over 30 miles of river channels, sidestreams, coves, inlets and quiet backwaters, the Siuslaw River estuary in Florence offers many hours of exploration and fun for anglers and paddlers in canoes and kayaks and on stand-up paddle (SUP) boards. Like many coastal rivers, the Siuslaw is a tidal-influenced estuary -- a mix of fresh and salt water that flushes in and out every 6 hours -- with tidal changes affecting the river and its tributaries for more than 20 miles inland. It's most fun to use those tides to your advantage. In many cases this means starting an expedition a couple of hours before high tide and riding it in for a few miles, then getting a ride back when the tide changes. It's like a hiking trail that's downhill all the way! If you've ever toured the back roads around the Siuslaw River – and its North Fork, in particular – you've already gotten glimpses of the area's remarkable beauty. Framed by thick forests rising steeply from the coastal plain, the river and its maze of side channels and back bays are interwoven with classic wetlands and low-lying islands and pasturelands, some of which are inundated at high tide and become glistening mudflats at low tide. But no matter how many times you've driven the local roads, there's nothing quite like a waterway perspective for appreciating the beauty of a place. The wonder starts almost immediately after launching your craft, usually with a close encounter with birds and waterfowl. While ducks and other quarry fowl are skittish, the larger birds like geese and stately blue heron are more nonchalant, often flapping off only to land a few feet away. The channels also offer a variety of fishing opportunities, depending on the season. Prized for their salmon fishery, the Siuslaw and its tributaries also draw steelhead anglers. In autumn the main river can be busy with boats, but the rest of the year you won't encounter much marine traffic. The principal waterways are officially known as the Siuslaw River Water Trail. State and federal resource agencies worked with the local watershed council and the Confederated Indian tribe to place information and mileage signs at put-in/take-out sites, with further information available in a Siuslaw Water Trail map/brochure and at their website, www.siuslawwatertrail.com, where you can download the map. The longest potential trip starts near the head of tidewater at Farnham Landing a couple of miles beyond Mapleton on Highway 36. A $4 Lane County Parks permit is required. The river here is placid for most of the year, the exception being right now when greater amounts of fresh water pour out of the Coast Range. These robust flows along with the outgoing tide will bring you in short order to Mapleton, where in addition to a nice floating dock at Mapleton Landing, there's a more traditional boat ramp just downstream (another $4 county boat ramp). 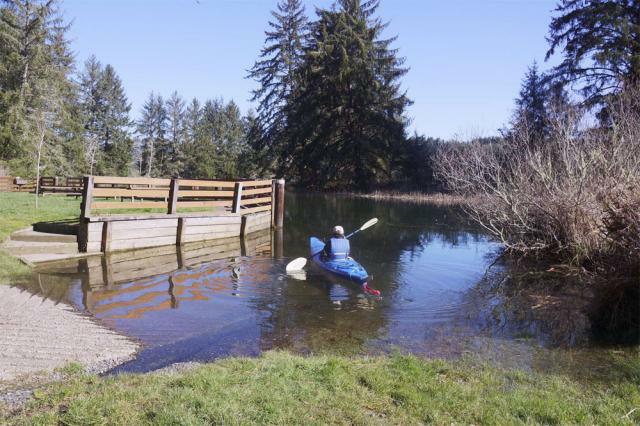 The Tiernan county boat ramp is the next landmark, while three-quarters of a mile beyond, the Siuslaw River reveals one of its secrets. As you might have noticed when driving Highway 126 from Florence to Mapleton, the river runs alongside for most of the way. It makes for a scenic drive, but from the river, the highway's proximity isn't much fun. The good news is that for part of the way, the river splits into a channel called Duncan Inlet, which effectively creates an island that separates the inlet from the main stem (and adjacent highway). It flows through peaceful countryside and reconnects with the main river near Cushman. Other potential paddling trips can explore the Siuslaw's aforementioned North Fork, with a nice launch site at Bender Landing, 3 miles upriver. The North Fork meanders many miles inland through pasturelands, and it's tidally affected for many miles, providing fun out-and-back possibilities. Other water trail trips include the Siuslaw River's little-known South Slough – not nearly as impressive as the South Slough near Charleston, but reliably tranquil. Immediately adjacent is South Inlet, which as the name implies is a south-running arm of the estuary. Those last two trips are best launched from the marina in Florence Old Town, which is also the place to launch if you wanted to tour the Florence waterfront or drift under the iconic Siuslaw River Bridge. The last 5 miles of the river on its run to the ocean is a wide channel, often exposed to wind, not much fun except on a calm day. There are lots of places to stop for a break on sandy beaches to the west, and as the river nears the sea, on the east side as well. As usual, these are just suggestions that perhaps will inspire you to make your own discoveries in this watery wonderland "out our back door."